Yesterday I ran my learning technology strategy workshop as a preconference event at ASTD’s International Conference. I had a crowd of about 16 people who represented a range of experience and responsibilities. The organizations ranged from academic to industry to information and communication companies. Some were just starting with elearning, and others had quite a bit under their belt. When I went around the room asking what people were hoping to get out of the day, a lot of mentions of LMS and elearning made me realize that the title of “elearning strategy” had perhaps misled people into thinking this was just about courses online, whereas I was going quite a ways further through my performance ecosystem. I took some time to explain that my vision of learning was far beyond courses, and included problem-solving, innovation, and more. I did try to spend more time on eLearning and advanced ID than I’d originally intended, but still felt the rest were things they needed to get their minds areound. 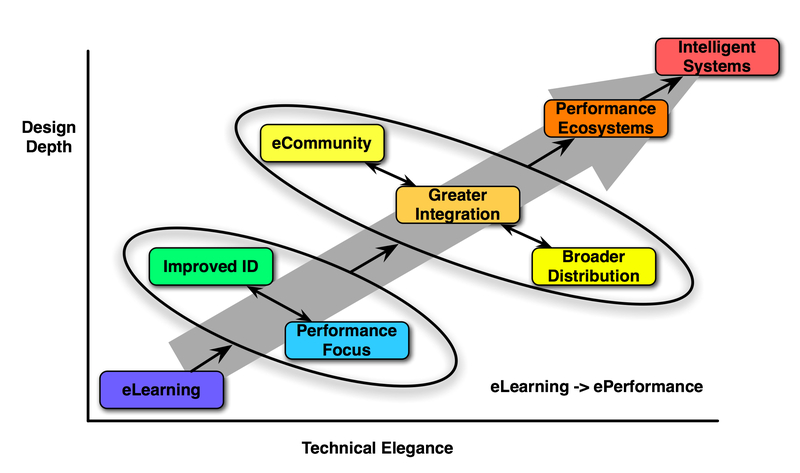 As we got beyond the performance focus stage (after Improved ID and eLearning), it became clear we were in pretty much uncharted territory for most. I continued on, defining each element, giving examples, and working through the costs and benefits. The attendees, perhaps loosened up by my goofy humor (no situation so bad that a bad pun can’t make it worse), were very good about asking questions and challenging me (I like that, either they or I learn something), to make sure a shared understanding developed. While it was a lot of ‘me talking’, I did have them self-assess where they were (as one later said, he got tired of saying “no” so often) and broke down the steps into action items they could choose to pull into a plan and prioritize. The outcome was maybe even better than I’d hoped. As I asked for what folks might have planned for going back, the first three who shared were completely divergent. One was going to focus on performance support, one was going to review their elearning templates, and one was going to take a stab at social media. This was just what I had hoped, that they’d take where they were and this broader perspective on what the learning function could be, and find the right next step for themselves. I also loved reading the evaluation sheets afterwards (careful to not know who said what). I was thrilled to see folks saying (paraphrasing a repeated sentiment): “I’m in awe of how much there is to think about, but really excited about the potential and opportunity to really have an impact”. They really felt it was valuable, and that’s always what I hope to achieve. There’s surely room for improvement, and extending it to put in some activities would be an option, but as it is I couldn’t be happier. I admit that the focus of the workshop was not what I had expected, but admittedly what I needed. Following your presentation, which I would estimate was about 7 hours, I spent an additional 3 hours thinking about it. And at some point, I began to understand. My organization, with which you are familiar, currently defines “learning” very narrowly. I am eager to expand that definition and our approach to it. Lucille, thanks so much for sharing. I’m really pleased to hear that it had an impact, and I wish you the best of luck with your journey.